When I read this article in TreeHugger it just rang so true to me, at some point in my life my mom just began referring to things as "when I die, you can have this bracelet"... but it's not just one thing, it goes through just about everything - dishes, pots, pottery, christmas decorations, you name it. It's a private thing and I am sure my sister gets it on her side as well, however my sister does not appreciate the finer things in "stuff" like I do - so I'm pretty sure I get it more often than she does. So when I found this story on 'Swedish Death Cleaning' something inside me perked up. Part of me thought that it was going to be about some kind of hard-core cleanliness cleaning type thing, which of course is possible with Swedes, but it's not... and there is a book about it, written by a Swede of course, The Gentle Art of Swedish Death Cleaning, by Margareta Magnusson. I think that a big part of this is cleaning up your life so that your family doesn't have to deal with it after your death, practical right. Magnusson says that the first secret to effective death cleaning is to speak about it always. Tell others what you're doing so they can hold you accountable. 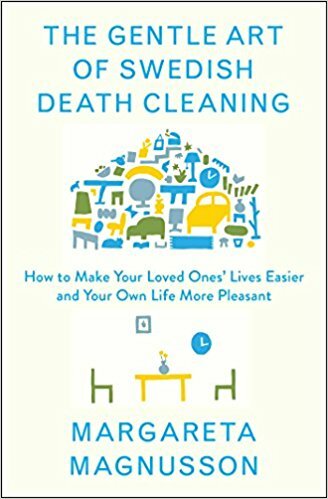 "Death cleaning isn’t the story of death and its slow, ungainly inevitability. But rather the story of life, your life, the good memories and the bad. 'The good ones you keep,' Magnusson says. 'The bad you expunge.'" 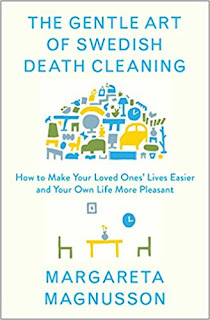 Finally, Magnusson encourages those engaging in Swedish death cleaning to reward their efforts with life-enhancing pleasures and activities, such as going to watch a movie, spending time in the garden, or eating an enjoyable meal. Besides, you need to enjoy yourself after purging all those belongings. I am pretty sure I would enjoy this book, but I'm not ready for it. I have to say that personally I can't picture this happening with me, if you know me and you've seen my home you know I love all my 'things' and can't imagine life without all of these memories around me. You can pick up anything in my home and I have a story behind it... many of those stories include how I hide any of my thrift shopping from my husband. And don't tell my husband about it... I will never hear the end of it.